I’ve never had peruvian food…and as we waited patiently for the waiter to take our order…and as our patience wore thinner and thinner…I thought I never would. This restaurant opened last summer on the soon to be newly refurbished Calle Santa Isabel. I think this particular local has changed purpose, name and cuisine every year I’ve lived here. At the moment it is Tumi Restaurante Turístico Peruano. I hadn’t realised that Peruvian food had the reputation as being one of the best cuisines in Latin America. 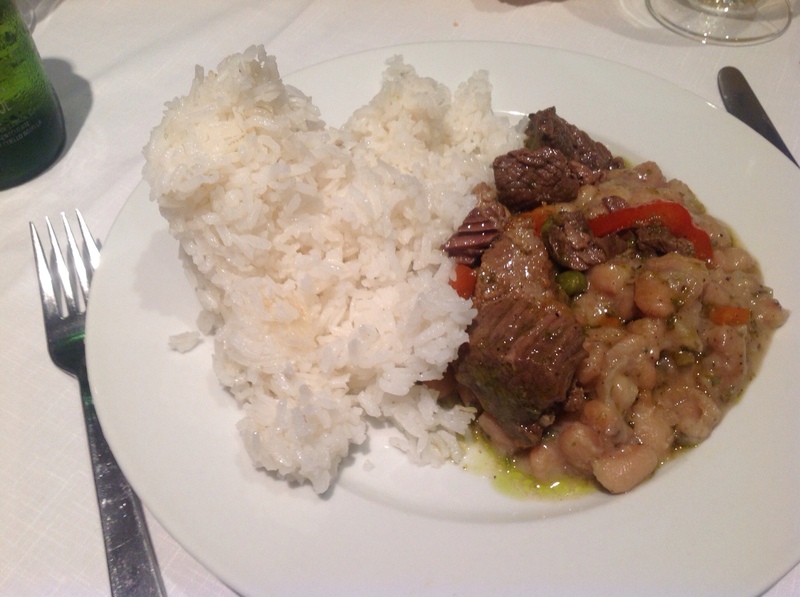 I also read later that Peruvian food was the fad de jour in London (last year it was Spanish food, I believe). Another surprise was the culinary influence of the many Chinese immigrants to Peru over the years. Tumi is brightly lit and decorated with pictures of famous Peruvians. Well, I assume they’re famous…I couldn’t think of any apart from Ivan Zamorano. And it turned out he was Chilean. It was a weekend and the menu del día was 13€ for 3 courses with a glass of wine or a beer. I ordered fish ceviche as I’ve never had it. You might say all ceviche is fish…but I’d stop you there with a waving finger and a tut-tut…apparently they do prawn ceviche too. It’s thinly sliced white fish which is “cooked” in Tiger”s milk..lemon juice, lime juice..not sure really..there might be some CharlieSheenMilk in there too. 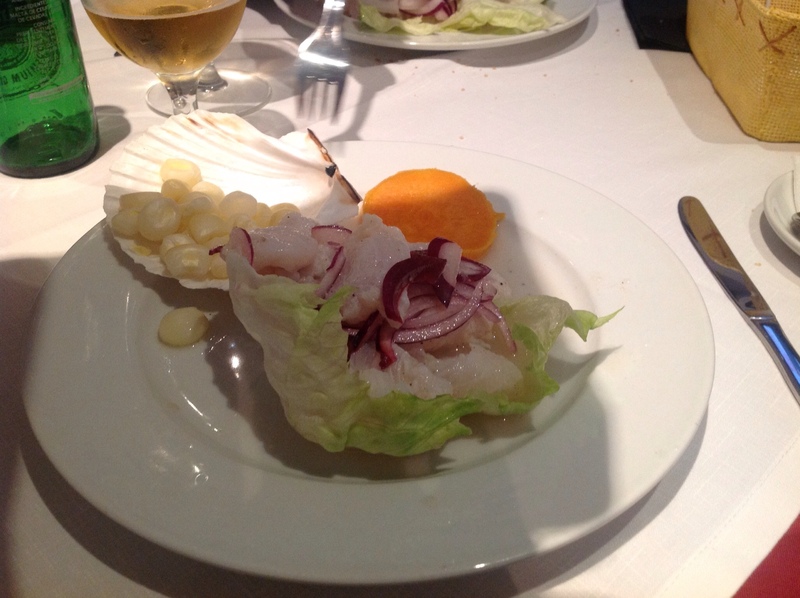 Served on lettuce with red onion…some weird sort of alien corn on the side and a slice of sweet potato/yam. Nae bad. We waited another good while for second course. I had the feeling the waiter and the woman behind the bar…and the cook…were all the same person and the waiter was having to do some sort of elaborate Inspector Clouseau quick change routine…for some obscure reason. Finally main courses arrived…but the food we’d ordered wasn’t the food which arrived and had been destined for a different table. Another quick change…a bit of cooking…a change back into the waiter disguise..and we received our main courses twenty minutes later. Mine was a beef stew with beans served with enough rice to feed a hungry unit of the Shining Path after a hard day’s class war. It was tasty enough. Slightly…cool…but, but to be honest, I spent enough lunchtimes eating tepid food in lokantalar in Istanbul that the heat of a dish doesn’t bother me in the slightest. Pudding was a peruvian version of flan. Which was just flan really, except maybe a bit bigger than you’d generally get in Spain. Three courses in almost three hours. Not that it makes much difference to me, I have a sad empty life (hence this blog)…but if you fancy giving this restaurant a go, you might have to pencil it in for a whole afternoon. Of course, they could have just been having a bad day…maybe short of staff….a waiter might have called in sick with a sore thumb which meant he couldn’t comfortably hold a pen….like a teacher in a certain institution did recently. This entry was posted in Centro, Lavapiés, menu del día, Restaurants and tagged Anton martin, Atocha, Lavapiés, menu del día, Peruvian, Restaurant. Bookmark the permalink.